The Grass Compression Gland works just like our normal round stem compression gland system but is designed for sealing bladed grasses or corn. 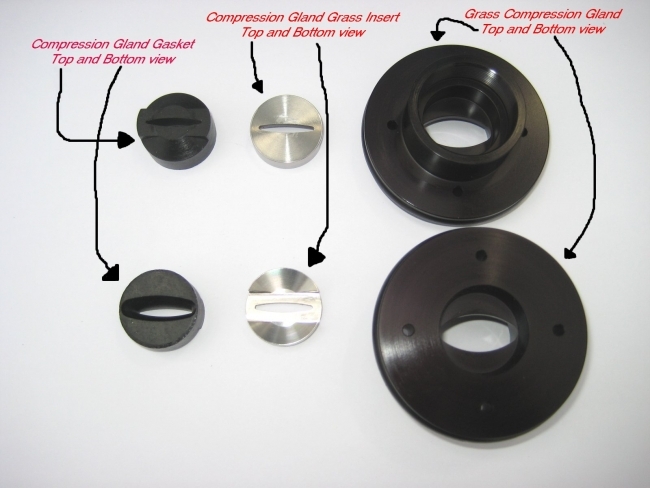 If your instrument is fitted with the Compression Gland already you will need the three items below. They are shown with both top and bottom views. If your instrument does not have a Compression Gland, you will need to have your lid modified to receive the Compression Gland. Contact us directly for more information. The Grass Gasket is 1.0 inch in diameter. The sealing “slit” is 3/4” long and 1/8” wide at the widest place. It is an eliptical opening.